This is not for ALL Christians. I hope it's not even for most Christians. But it is for many Christians. Namely those who cry foul at the phrases "Season's Greetings" or "Happy Holidays." This is for the Christians who want to boycott retailers who do not say "Merry Christmas." You know, those Christians who say businesses and the left are trying to take the Christ out of Christmas. You have annoyed me almost to the point of angst. So I though I'd take some time today and explain to you why I think you are wrong in your supposed fight to save Christmas. First off, a lesson. The only higher power businesses answer to are their bottom lines. If a business were to choose to be more inclusive in its seasonal greetings, they have that right. Just like you have the right to (quietly) spend your money elsewhere. Businesses who choose to say "Happy Holidays" simply realize non-Christians have money. Naturally, they want to welcome that revenue. 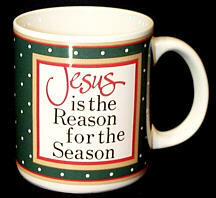 And from what I've read on mugs, "Jesus is the reason for the season," not retail. In my humblest of opinions, recognizing the birth of your lord and savior should not have anything to do with shopping. Once you have reduced the Christmas spirit to a phrase at a store, you've already taken the Christ of out Christmas. What about peace on earth and good will toward men? Are right-leaning Christians not supposed to support that in a time of war? I mean I could be wrong. I may be missing their argument altogether. But this is what I hear: we Christians want businesses to say "Merry Christmas." If they do not - if they replace it with something that acknowledges non Christians, we will be outraged. We will take our Christmas cheer (read: dollars) and go elsewhere because including others who do not believe as we do is not what we're about. The whole idea of boycotts stemming from Christmas is just ridiculous. But tell me what you think. Amen! I just did a story on this topic, and in my limited amount of time, couldn't find anyone who agreed with you. Unbelieveable!